What: Meditation Machine exhibited at Speed Show: Rebelhuis 'A one night event at Ace Teleboutique'. Speed Show is an exhibition format invented by German conceptual artist Aram Bartholl. 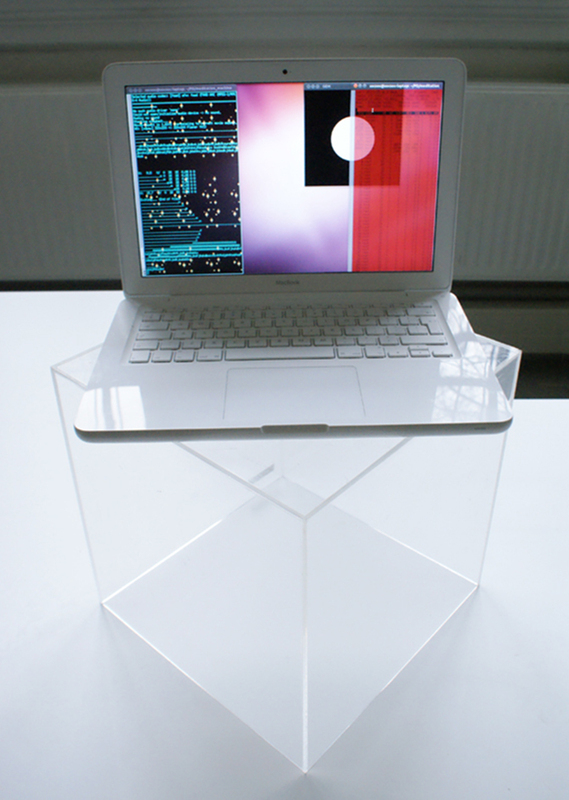 This work was made during my study at the Networked Media Masters, Piet Zwart Institute and curated by net artist Olia Lialina. Participants include: Albert Jongstra, Ozalp Eroz, Birgit Bachler, Danny van der Kleij, Darija Medic, Dusan Barok, Fabien Labeyrie, Inge Hoonte, Fako Berkers, Lieven Van Speybroeck, Laura Macchini, Megan Hoogenboom, Mirjam Dissel, Natasa Siencnik, Renee Olde Monnikhof, Tolga Ozuygur and Yiorgos Bagakis. Where: Ace Teleboutique, a ‘belhuis’ located in the city centre of Rotterdam. Humans have always dreamed of higher knowledge, progress and amplification of human virtue just as much as dampening out weakness in order to perfect ourselves and our societies. In short we desire to transcend all that is humanly impossible. Technology, especially communication technology in some ways is the instrument in which our irrational desires are invested in, however always falling short of our expectations. It is precisely because it cannot perfect our inherent flaws and human deficiencies that makes technology compensatory. The nature of desires lies in its unattainability, driving and producing more technology in the hopes of achieving the inconceivable, moreover it underlines the expectations of a machine's existence and function. If a machine inevitability embodies its inventors' desires, my rhetorical question is can it free itself from its' masters reign? What would technology be without desire? Can you strip it away, and if so would that equal to liberation, autonomy or even self-consciousness? My idea to create a machine that meditates stems from these train of thoughts - meditation to metaphorically detach itself from its inventor's desire (as meditation refers to a large family of practices I refer only to the meditation practices of the Shambhala teachings of Tibetian Buddhists to prevent confusion or discrepancy). Using Puredata to amplify the CPU information, the computers internal processing, the audible sound functions as a kind of flow of breath or visceral heart beat. Simultaneously the visualization of the sound acts like a meter, reflecting the CPU's fluctuating movements as different programs open and close.